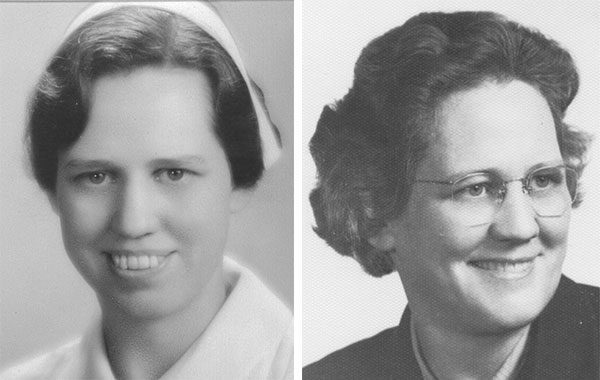 Emma Hyer as a young nursing student in the early 1930s, and during her final term in the 1950s. On June 30, 1936, Emma Hyer, RN, arrived in Freetown, Sierra Leone. The next day, she traveled on to Gbangbaia, where we had a medical dispensary. Since 1934, Dr. Lesley Huntley, our first physician in decades, had been laboring there pretty much on his own. Now, finally, he had a trained nurse to assist him. Emma was from the United Brethren church in Coleta, Ill. She graduated from Huntington College in 1931 and went on to earn her nursing credentials. She was among six Huntington College students who committed themselves to missions during a special service during the late 1920s, and who went on to spend many years in Sierra Leone. Dr. Huntley and his future wife, Mary Bergdall, were two of those students. Charles Saufley served two terms starting in 1928. Martha Anna Bard gave 27 years of missionary service. Erma Burton, upon arriving in Freetown in 1932, married her longtime fiance Clarence Carlson. All but Charles Saufley were on the field when Emma Hyer arrived. Nurse Hyer wrote that on her first day at the dispensary, they had 65 patients but, despite a long day of work, could only treat 40. That would become her new normal. When the Huntleys left Africa at the end of June 1937 for a year of furlough, she ran the dispensary on her own—delivering babies, extracting teeth, and the occasional emergency appendectomy. One day she cut out, without anesthetic, the tail of a stingray embedded in the fleshy part of a fisherman’s thumb. George Fleming gave her credit for saving the life of Clarence and Erma Carlson’s young son, Jimmie, who caught whooping cough and needed days and nights of constant care. The Huntleys returned to Gbangbaia July 1938 to November 1941. During his second term, they treated over 31,000 patients. Emma Hyer was there for most of that time; she took a year of furlough in May 1938, but returned to serve 1939-1942. She entered the military in April 1944 and spent 16 months in Great Britain, attaining the rank of First Lieutenant. She returned to Sierra Leone for one final term in 1952-1955, this time at the new hospital in Mattru. Peter Kemp was born June 28, 1749. He became a strong supporter of the movement started by William Ottebein and Martin Boehm. Kemp lived in a large stone house about two miles outside of Frederick, Md. His home has a firm place in United Brethren history. It apparently became a frequent waystation for Otterbein, Christian Newcomer, and other traveling ministers. But most significantly, Kemp’s home hosted 17 ministers for the 1800 conference during which we officially organized as a denomination and chose Boehm and Otterbein as bishops. The 1801 conference also met at the Kemp home. Peter Kemp was listed as a minister that year and covered a circuit of churches. Interestingly, the Kemp family operated a still. Members brought grain to be distilled into alcohol, and barrels of whiskey, according to some accounts, were stored in the basement. Peter Kemp passed away February 26, 1811. Minnie Mull with girls at the home at the Danville station in Sierra Leone. 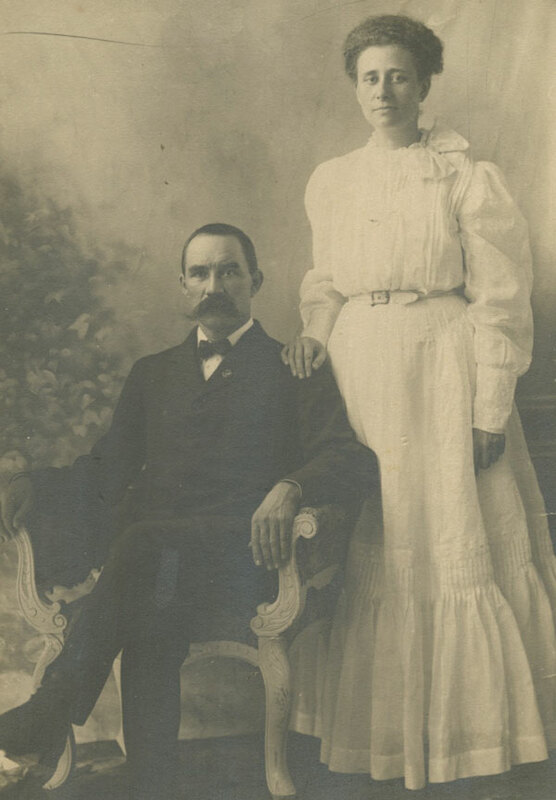 Minnie Mull and Charles Linker, UB missionaries in Sierra Leone, were married on June 27, 1906, in Freetown, Sierra Leone. At the time, they were the only UB missionaries on the field. They chose June because children at the two homes at the Danville station in Gbangbaia were on vacation. Four months later, Minnie was dead. And she would not be the only missionary to die there. 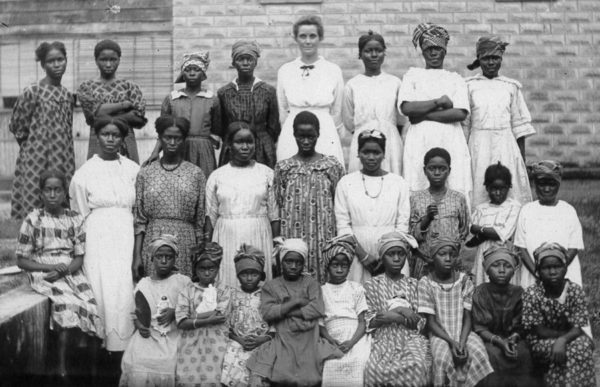 In 1900, the Women’s Missionary Association decided to build a home for girls at the Danville station in Gbangbaia. Rev. B. O. and Margaret Hazzard arrived in September 1900 to build the home. Margaret was stricken with beri-beri and, paralyzed, was evacuated to England, where she began a very long recovery. But Rev. Hazzard kept working. The building was ready for occupancy in December 1901. Rev. Hazzard, stricken with blackwater fever, died at Danville the following July. Minnie Mull went to Sierra Leone in December 1904. She joined Lena Winkel, who had arrived in 1901, in running the new girls’ home. Charles Linker, from Elmore, Ohio, arrived in October 1905. Minnie became ill in early September 1906 and was taken to the government hospital at Bonthe on September 10. After a couple weeks she returned to Danville to continue recuperating. But in early October, she experienced a relapse, and Charles was advised to get her to the hospital ASAP. On October 18, she was placed in a boat, and five oarsmen began rowing toward Bonthe, knowing that their passenger was terribly ill. Just minutes from the dock at Bonthe, with Charles at her side, Minnie Linker passed into eternity. Charles Linker said he would remain at his post, and he did. Reinforcements arrived on November 19, 1906: Christopher and Bessie Wilberforce. Christopher was the son of a Sierra Leone paramount chief, and had been in the States for five years attending college. He married Bessie Ramsey of Dayton, Ohio, and they made themselves available for missionary service. Charles Linker returned to America in early 1908, and the work moved along smoothly under the leadership of Christopher and Bessie. But on June 15, 1908, Bessie died minutes after giving birth to her first-born child, a son named Theodore. Once again, shock and sorrow descended on the mission community at Danville. A month later, Rev. and Mrs. August Stoltz of Ontario Conference arrived, followed soon by John Woodard of North Ohio Conference. They just kept coming. Charles Linker, after an 18-month furlough, returned to Sierra Leone for one more term in December 1909, and concluded his service in Africa in October 1911. In 1923, a new home for girls opened in Bonthe. It was named the Minnie Mull Memorial Home. Here is some information about the upcoming US National Conference, July 12-15 in Lancaster, Pa.
On Friday night, a ten minute video will be shown to recognize the role of the Women’s Missionary Fellowship throughout our history. The WMF is being discontinued as an official organization, but Global Ministries wants to honor it’s enormous contributions over the years to United Brethren missions. On Thursday and Friday (July 13 and 14), shuttle buses will take people to either two or four sites of historical significance to the United Brethren church. The tours are free, but you will need a ticket. Tickets will be available at the conference registration table. Isaac Long’s Barn. This barn, built during the 1750s, is where it all began—the place where William Otterbein and Martin Boehm met and began working together. Boehm’s Chapel. Martin Boehm built this church on his own property, overlooking the Boehm homestead. The gravesites of Martin and Eva Boehm are located here. Byerland Mennonite Church. This is Martin Boehm’s home congregation. First Reformed Church. This was William Otterbein’s charge when he started working with Boehm. A morning option will accommodate local UB churches that want to send their constituents. Thursday: 11:30 am, 1:00 pm, 2:00 pm, 3:30 pm. Friday: 10:00 am, 10:15 am, 10:30 am, 1:00 pm, 1:15 pm, 3:30 pm, 3:45 pm. On Friday afternoon, there will be a four-hour tour of all four sites—Long’s Barn, Boehm’s chapel, Byerland Mennonite Church, and First Reformed Church. It departs from the convention center at 1:00 p.m.
Charter buses will provide transportation. You may bring food or drink with you on the bus. Churches have registered their ministerial and lay delegates. If you need to make a change regarding the personnel attending the business session, please contact Marci Hammel at marci@ub.org or (888-622-3019, ext. 308) as soon as possible. All ministerial and lay delegates and advisory members are required to attend the breakfast at 8:00 a.m. on Thursday, July 13. The breakfast is being sponsored by Global Ministries, which will be charged for the meal whether you attend or not. Please attend at 8:00 for the breakfast and presentation. We appreciateGlobal Ministries providing this meal as a start to the day’s Business session. A breakfast for retired ministers, spouses, and widows will be held at 8:00 a.m. on Friday, July 13. This breakfast is by reservation only. A limited number of sets are still available. Contact Judy Dyer at judy@ub.org or by phone (888-622-3019, ext. 313). Three excursions are planned for Thursday morning for women who are not participating in the Business session: the Tabernacle Reproduction, the Tanger Outlet Mall, and a Walking Tour of downtown Lancaster. Descriptions of the excursions are here. The morning starts at 8:00 am. Women will meet for breakfast ($5 ticket required) and devotions by Christy Cabe. Buses leave for the Tabernacle Reproduction and Tanger Outlets excursions at 9:00 am, and the Walking Tour starts at 10:00 am. Bishop Emeritus Clarence A. Kopp, Jr.
On June 25, 1981, Clarence Kopp was elected as a bishop, a role he would fill for the next 12 years. Clarence A. Kopp, Jr., was born on May 25, 1927. He described himself as spending most of his life chasing after Clyde Meadows. In 1950, he became the first associate pastor to work under Meadows at King Street UB church in Chambersburg, Pa. Back in Ohio, he became a pastor-superintendent, a role which Meadows held for 27 years. He was elected bishop in 1981, exactly 20 years after Meadows was elected to that position (eight years for Meadows, 12 years for Kopp). Upon relocating to Huntington, Ind., he moved into the house Meadows had built. As bishop, Kopp also served four years, as Meadows did, as president of the International Society of Christian Endeavor. At the time, we had about 75 different organizations in the church–seven Christian Endeavor societies, 30-some Sunday school classes, three girl scout troops, etc. We secretly divided these groups between us. He would oversee this group, I would oversee that group. We wouldn’t tell them; we would just look after them on our own. Later, we exchanged some groups. He would preach one Sunday morning a month. In revival meetings, we would each take a couple nights in a row, with people never knowing who would preach that night. We deliberately worked it so the meetings wouldn’t develop around the personality. Visitation was a big part of the assistant’s job description, and Clarence Kopp was the best visitor I’ve ever known–much better than I was. He would take half a dozen folders from our church files, put them on the car seat, glance at them before going in to see a family, and be able to talk to them intelligently about their background, interests, ages of children, and church involvement. He visited as many as 2,000 families a year, and those visits resulted in new people coming to church. In time, we both noticed a problem taking shape: within the same congregation, we were developing a Kopp following and a Meadows following. Clarence didn’t cultivate this, and he didn’t desire it. It’s just that he was good at what he did, and people were drawn to him. A different person in his situation could have split the church, but he didn’t want that any more than I did. There were no problems between us, and I was thrilled to have such a capable associate. After three years, Kopp’s home conference wanted him back, so he left to pastor his own church. During his years as pastor of Prescott Avenue UB church (Dayton, Ohio), the attendance increased to over 400 and numerous people found Christ. He later became pastor of Redeemer UB church (now Living Word) in Columbus. He was pastoring Redeemer when the General Conference elected him bishop in 1981. After leaving the bishopric in 1993, he spent two years as fulltime superintendent of Central Conference. In 1998, he helped start Anchor UB church in Fort Wayne, Ind., and attended until declining health made it too difficult to make the weekly journey from Huntington. Anchor was a restart of Third Street UB church, which was Kopp’s home church. Clarence and Virginia Kopp both graduated from Huntington College. They were married nearly 60 years and gave birth to four children. Together, they traveled to all 50 states, to China, Russia, Australia, New Zealand; and to Europe many times. Most treasured of all were their seven trips to the Holy Land. Virginia passed away January 2, 2015. Bishop Kopp passed away September 17, 2007. He was 80 years old. The 2005 General Conference met on June 24, 2005, in Huntington, Ind., following four (long) days of meetings by the US National Conference. They welcomed two new national conferences: 21 churches in Mexico, and 17 churches in the Philippines. They joined the seven “charter” national conferences from the 2001 General Conference. Up to that point, every national conference involved churches which United Brethren people had pioneered. We started the churches in the US, Canada, Sierra Leone, Jamaica, Honduras, Hong Kong, and Nicaragua. But with Mexico and the Philippines, we were adopting churches which wanted to affiliate with us. The same would be true of the churches in Guatemala, which joined as a national conference in 2005. In the Philippines, there were 17 churches (about 1000 people) which had been started since the 1980s by Rev. Prudencio Lim, a gifted evangelist. The UB connection began in 1999 through the Franklin UB church in New Albany, Ohio. Pastor Mike Brown and an evangelistic team helped Pastor Lim hold a crusade in Luzon, and persons returned nearly every year to help conduct additional crusades (all of which resulted in new churches). In 2004, the Filipino pastors unanimously requested to join the United Brethren church. The process was more direct in Mexico. Denis Casco, as director of Latin American Ministries, developed relationships with a number of churches in Mexico. When Latin American Ministries was discontinued, Casco continued leading the churches in Mexico. The meeting consisted mostly of verbal updates from the national conferences about their work. The main item of business was accepting two new national conferences into the United Brethren worldwide community. In 2004, Peter Lee and Mark Choi of Hong Kong Conference met with the Filipino leadership and found their governing documents to be in order. In February 2005, Brian Magnus (Canada), Francisco Raudales (Honduras), and Gary Dilley (US) met with the Mexican leadership. Their documents got a thumbs-up. And thus, we increased from seven to nine national conferences. 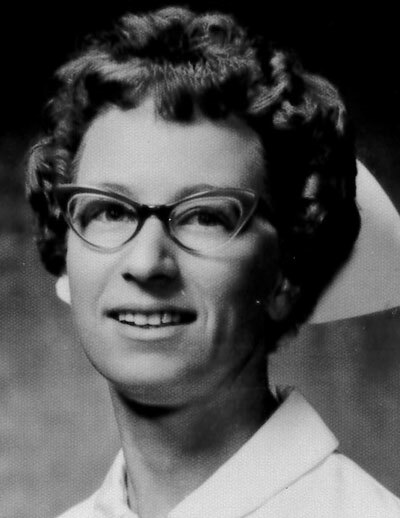 On June 23, 1957, Kathy Corcoran began the first of three terms as a missionary nurse at Mattru Hospital in Sierra Leone, spanning 1957-1968. Kathy was from the United Brethren church in Woodland, Calif. As a high schooler, she felt God calling her to the mission field, and she chose nursing as the way she would serve God overseas. After a three-year course in Oakland, Calif., she took specialized courses on mid-wifery at the New York Maternity Center and at Johns Hopkins Hospital in Baltimore, Md. Throughout the 1950s, we intended to open a hospital in Mattru, but couldn’t find a doctor. A team of dedicated nurses were doing a lot of medical work, and a government doctor came from Bo once a month. But we really needed a fulltime, full-fledged physician. Then we learned about Dr. Alvin French, who worked with another denomination and was being sent home after just one year on the field. They apparently didn’t need him. Field Superintendent M. E. Burkett invited French to complete his term at Mattru Hospital—an idea that was already in the doctor’s head, since he had visited Mattru soon after arriving in Sierra Leone. In May 1957, Alvin and Barbara French and their two children settled in Mattru. Kathy Corcoran arrived the next month. As a certified midwife, she kept busy delivering babies—one of whom was the third French daughter. On June 7, 1969, Kathy married Alan Jones, an Englishman who had taught at the UB Centennial Secondary School in Mattru. In the second volume of “Trailblazers in Sierra Leone,” published in 1973, George Fleming reported that Alan and Kathy were living in Quebec and had a daughter, Phillipa. Several times during our history, we’ve had just one bishop. But never by design…until 1993. Newcomer passed away in 1830 just one year into his latest four-year term. The next General Conference was three years away. The other bishop at the time, Henry Kumler Sr., served by himself until 1833. General Conference then elected a total of three bishops, perhaps wanting to hedge their bets. In 1953, we went from three bishops to just two bishops. 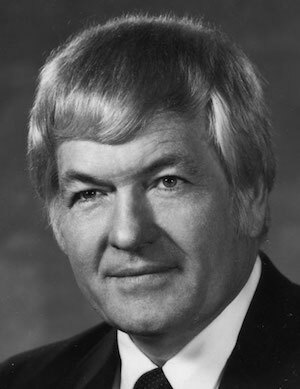 Clyde Meadows was one of those two bishops throughout the 1960s (1961-1969), and served much of the final year by himself after Bishop Robert Rash suffered severe heart problems. In 1969 we elected three bishops, increased to four in 1973, and back down to three in 1989. However, the idea of having just one bishop came up in 1965, and never went away. A 1981 study committee recommended having just one bishop, and the notion kept percolating throughout the 1980s. Finally, with all three bishops set to retire in 1993–Ray Miller, Jerry Datema, and Clarence Kopp–it seemed like the right time to do it. And one name kept surfacing: Ray Seilhamer (right), who was then president of Evangelical School of Theology in Myerstown, Pa.
Ray Seilhamer was elected on June 22, 1993, as the only United Brethren bishop. He served eight years in that role. Since then, four more persons have served as the only bishop–Paul Hirschy, Ron Ramsey, Phil Whipple, and Todd Fetters. On June 21, 1987, North Ohio Conference dedicated the Weatherwood Center, the centerpiece of the new Michindoh Camp and Conference Center outside of Hillsdale, Mich. The 33,000 square foot lodge featured large and small dining areas, an air-conditioned meeting hall, a chapel, a game room, offices, bookstore, and elevator. Plus 26 motel-style rooms. 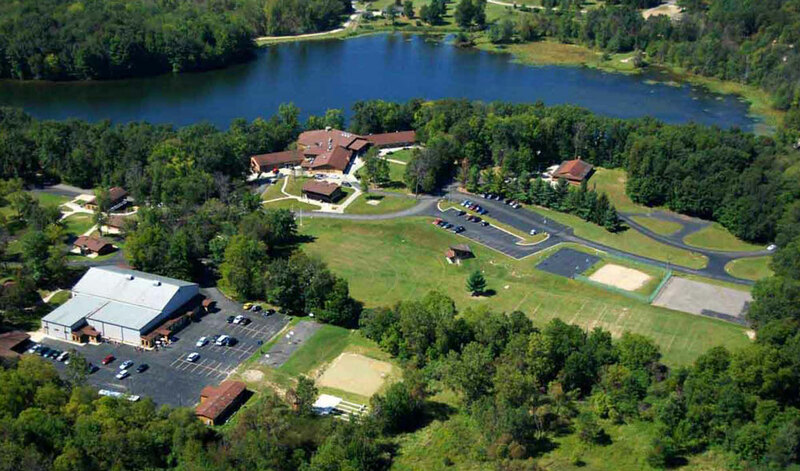 In September 1983, North Ohio Conference took possession of 243 acres of prime land just three miles down the road from its existing Rothfuss Park campground (definitely rustic). The Merillat Foundation paid for the property and financed a massive amount of construction—camper cabins, beach house, full-size gym, RV sites, cabins with four apartments each, recreation areas, and much more. Paved roads, not common at church camps, meandered through the grounds. With the completion of the Weatherwood Center, the camp was ready to go. Seven weeks of summer camp were held there in 1987, along with annual conference and various retreats (men, women, youth, singles). 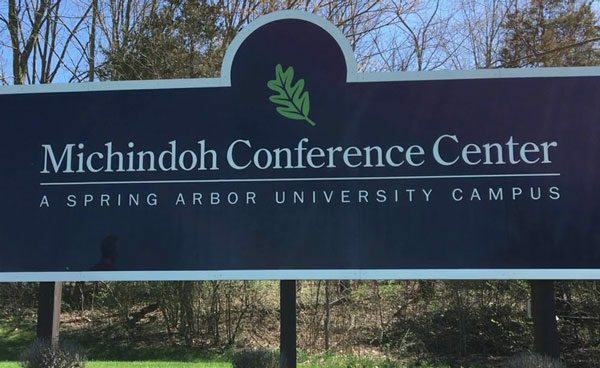 Under Cliff Miller’s leadership, the Michindoh Camp and Conference Center flourished and became a widely-respected ministry. In addition to the summer camps and all kinds of adult-oriented retreats, they were serving 120 youth a week in outdoor education programs for Toledo and other school systems, and hosting 20 weeks a year of Elderhostel for senior citizens. United Brethren people sometimes referred to Camp Michindoh as one of our “crown jewels.” But crown jewels are expensive. 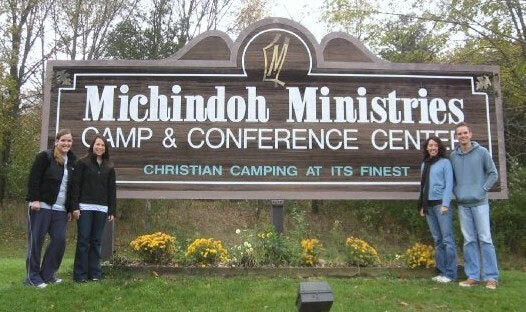 And by 2005, when we dissolved the annual conferences, Camp Michindoh faced huge maintenance costs. Our other camps quickly organized as independent ministries. 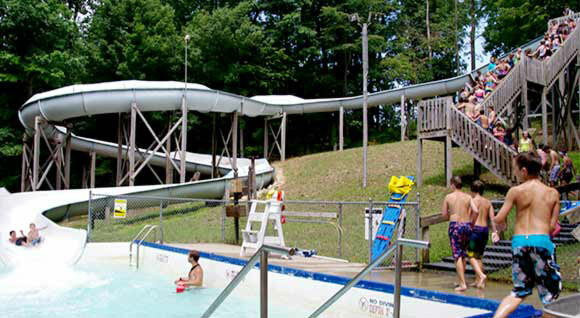 However, it took two years to settle the future of Camp Michindoh. After various other options didn’t work out, the camp was deeded to Spring Arbor University, a Free Methodist college. Don and Leora Ackerman and children in 1956. Don and Leora Ackerman were married on June 19, 1947, at the Van Orin United Brethren church in Illinois. They had met at Huntington College, and after the wedding, they both taught school in Huntington Township. However, they soon sensed God calling them to the mission field. It turned out to be Honduras, where they spent nine years. Don grew up in Sabetha, Kansas, became a Christian at a United Brethren campmeeting, and enrolled at Huntington College in 1939. He entered the Army in 1943 and was initially trained to fly the P-40 fighter. He had no trouble hitting ground targets, but said, “When it came to an aerial target, I was absolutely no good at all.” He then trained to fly the B-26 bomber. When the Army decided to stop using the B-26, they sent to train on B-17s. By the time he finished that training, the war in Europe ended. So he was sent to bombardier school at the B-29 base…where he basically sat until Japan surrendered. 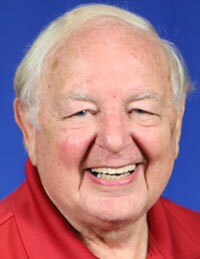 Don returned to HC in the spring of 1945 and graduated in 1947 with a teaching degree. Leora Smith was born in Kansas, but lived most of her life in Illinois. She was converted as a child under the preaching of her father, Rev. Cecil Smith. She graduated from Huntington College in 1946, following in the tracks of her older brother and sister. Her sister Juanita spent 15 years as a nurse at Mattru hospital in Sierra Leone, starting in 1950. In 1945, we assumed oversight of several English-speaking churches in Honduras. The first missionaries were Harry Flickinger and his family, who then pastored the UB church in Hillsdale, Mich. They went in February 1948. They were effective missionaries and accomplished a lot…for three months. Then severe illness struck Flickinger. Doctors advised him to return to the States ASAP, which he did. He was immediately hospitalized, and remained sick for two years. Flickinger’s illness was largely blamed on unsanitary living conditions. Mission director George Fleming was determined not to let that happen again. He spent two weeks in Honduras in early 1949 and bought a very nice house previously owned by a former ship captain. A Standard Fruit Company ship delivered the Ackermans to La Ceiba, Honduras, on July 22, 1949. What a surprise when they arrived at their new home–a fully furnished, two-story place with 13 rooms. So big, in fact, that the Ackermans decided to use just the first floor. The Ackermans were sent mainly to work in the sadly-equipped 80-student school located about a half-mile from their home. George Fleming had warned them about the Spartan conditions–crude furnishings, few books, practically no equipment. Don, a skilled carpenter, set to work crafting a bookcase, blackboard, and other items. A fellow at the fruit company designed a desk, and Don found people to build probably 100 of them, plus chairs. In addition to their school duties, the Ackermans were involved in the broader church ministry. They would spend practically the entire day at church—morning service at 9 a.m., Sunday school at 2 p.m., and an evening service at 7 p.m. The Ackermans both taught Sunday school classes and led the Wednesday night meeting. They saw the mission go through major changes, including the shift to a focus on the Spanish-speaking population and village evangelism. In 1956, Don had the vision to buy a large piece of property on the outskirts of La Ceiba. He built the first building there–a cement block mission house which, today, is the conference headquarters. Today, that property is also home to the Bethel Church and the Bethel school. The school was closed in 1957. However, the Missions board approached the Ackermans about going to Jamaica. They wanted Don to be principal of a new school Jamaica Conference was starting in Kingston. It would have been the first time UB missionaries were transferred from one field to another. However, the Ackermans were never able to secure visas. The Jamaican government figured Don would replace a national as principal of the high school–which was true. As it turned out, the school never got off the ground. Bishop Robert Rash told Don and Leora about a new UB church starting in Des Moines, Iowa. It could use workers. Don easily landed a position teaching math and science in a junior high school. 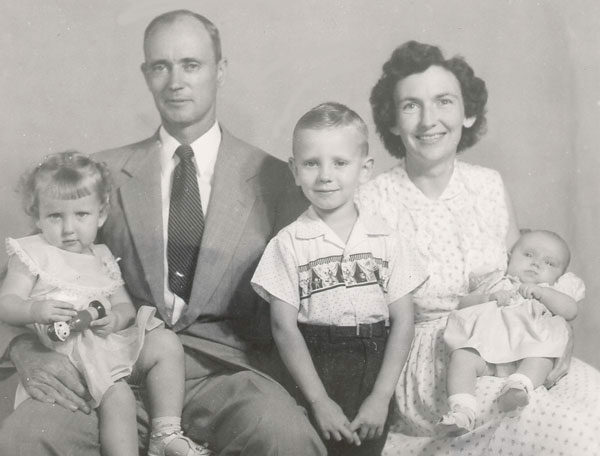 And there the Ackermans remained until they retired–faithfully serving in the Patricia Park UB church (now closed), going on the occasional work trip, and always remaining intensely interested in the people of Honduras. Don Ackerman passed away on July 9, 2008. Leora continues living in Hastings, Nebraska. Today would have been their 70th anniversary.